E-mail written Mar 2009 to Lew Griffin from Susan Mercer (Stewart) Green-Bruders, e-mail address. E-mail written 2003 from Lena Williams, e-mail address. William Thad Knox Sr., was born March 16, 1859, at Sweet Home, Lavaca County, Texas, near Cuero. He was an only child, son of John Hugh and Cynthia J. (Culpepper) Knox, died March 11, 1941, Coleman. 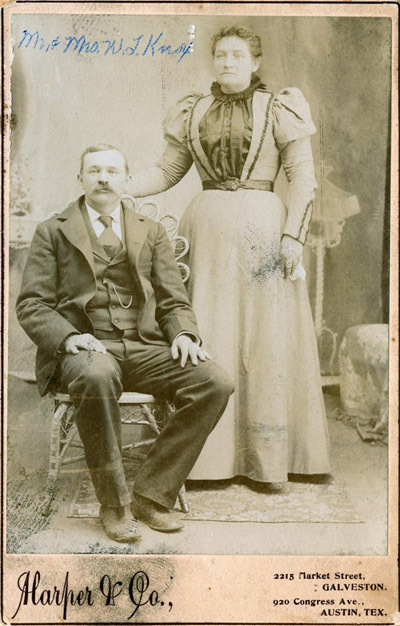 Sarah Annie Edgar, born April 30, 1859, Concrete, DeWitt County, daughter of Henry Edgar and Tabitha Jane (Brown) Davis, (second wife of Henry Edgar). Sarah died November 24, 1939. W. T., Sr. graduated from Concrete College in Concrete. He married Sarah Annie Edgar April 3, 1878, by Reverend Thomas, Vice President of Concrete College. She was a member of an old and wealthy family in DeWitt County. They had three children: Hugh, Cynthia Maggie and Henry. On coming to Coleman County in the spring of 1882, settling in Trickham he bought a ranch on Home Creek stocking it with cattle. He purchased the land for one dollar per acre. Three children were born in Trickham: George David, James Jesse and John Edgar. While a depression in the eighties hurt him financially, he was able to regain much of his fortune later. He taught school under First Grade Certificate from September, 1887 to June, 1892. He taught 2 years at Harrold and 3 years at Burkett. In 1894, he bought a farm one mile northeast of Coleman, across Hords Creek, where they established their family homeplace and continued to live there the remainder of their lives. The two-story home was a fashionable residence, the parlor having one complete wall of bay windows with stained glass overhead. W. T. and Annie celebrated their 60th wedding anniversary at the homeplace, April 3, 1938. Coleman County Historical Commission, History of Coleman and it's People, . E-mail written Apr 2009 to Lew Griffin from Kathy Knox Milller (Mrs. Ron Miller), Olympic View, WA, e-mail address. p 815; William was killed in an auto-train accident.